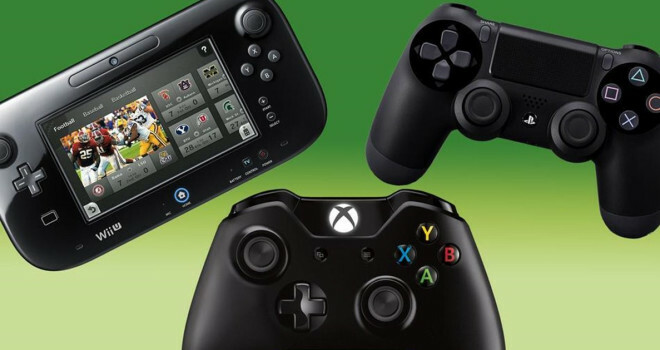 Your Anti-Friendly Guide To The Current-Gen Gaming Consoles. Remember when the only major selling point of a gaming console was that you can play bigger and better games on it? Well, nowadays it seems the only way to get over as a useful piece of technology is to introduce the non-gamer public to a machine that can do the same crap prepackaged that their computer, iPad/iPhone can already do. This is a troubling time for the industry and it’s not just from the transition of generations especially seeing as the current standard of mainstream games consists of brownish/grayish background combined a first person perspective of a white guy with a machine gun and you shoot things or Mario’s latest trip to the Furry Convention in the hopeless 1,231st mission to get “cake” from the princess. And for a guy like me, in a world like this, I’m cautiously optimistic about generation 8 of gaming or overly pessimistic or to end the ambiguity, I’m not exactly shitting bricks here. I’m pretty much in the minority here (My comfort zone) when I say that I don’t exactly have high hopes for Gen 8 if it continues to look like this. Why? Because of its numerous presenting reveals ranging from unimpressive to unsurprising, Tech company employees constantly talk down to us regarding what we think we want out of our hobby, and try to sell us on stuff they think we need in able to game to fullest in a not so subtle ploy to compete with Apple. And all in all I’m not feeling that this is a brand new day in gaming as a whole. I say a new gaming generation should introduce the world to new ideas in the field of gaming not newer and prettier graphics. This past E3 just demonstrated more of the same: More social media cash-in crap, More First Person Shooters, More established franchises coming back for more of the same while innovating absolutely nothing. Hell, even the new Smash Bros. looks exactly like Brawl with Megaman in it. All of which to me is an extension of the old generation instead of a brand new one. But with that said, we are currently in the 8th generation of our medium and just like the last generation, the major selling point of the consoles depends on the games and the feature that you, the consumer want from a console personally. Xbox One: It’s boasting crap features like not being backward compatible with Xbox 360 games though I wasn’t going to throw away my 360 to begin with. But what do I do if my 360 is destroyed or stolen and I want to play Super Street Fighter 4? It will only work on HDTVs so I would have to buy a new TV in able to play it. Assuming I’ve switched my brain with my scrotum. First off, My TV works just fine and I’m not in the market to buy a new one. It comes with a Kinect whether I want it or not. The kicker with the Kinect issue is that it is mandatory that it has to be connected to the console or it won’t even operate which is pretty stupid because Kinect interface doesn’t work all that well and you will just end up using the controller anyway. Finally, it’s the fact that you can’t use the console without the internet whether or not it’s actually high speed. I can’t do this because, well personally speaking because as it stands now, I don’t have internet in my place, I’m in the process of moving out in a couple of months and, I can’t accommodate the console’s need for that most because of personal issues that forbade me from doing so. Then, there is this. I’ll have to wait for the new models that will have the non-DRM stuff pre-installed. As for the games, it seems to be taking cues from its predecessor by targeting the generic American frat boy demographic who is easily impressed with glossy depictions of blood and guns with a lack of quality. RYSE springs to the top of my mind. And Dead Rising 3 and Killer Instinct are in my radar but that’s not enough to justify its insane asking price while, the rest are a joke and unfunny joke from the latest Simpsons episode. PlayStation 4: The slightly more affordable PlayStation 4. I don’t have much to say, I’ve never owned a Sony product in my life even the crap Sony made before the OG PlayStation so I’m not a vocal supporter of Sony and despite their arguably impressive showing at launch, the PS4 (at least to me anyway) isn’t exactly coming out smelling like roses either. I’m kind of neutral on this one. For one, the price is somewhat reasonable, it’ll make you pay for online features but I had an Xbox 360 from 6 years so it’s not a big deal, its works with or without Internet, you can play used games like every other console in existence. That’s all good but, my problem with the PS4 besides it also not being backwards compatible is that fact that there aren’t any games that interest me at least not right now. I’m not excited about Kingdom Hearts 3 or Final Fantasy XV because I’m not a JRPG/Anime/Japanophile Weeaboo. I never had a PS3 so I can’t get excited about Killzone or Infamous: Second Son only because I myself haven’t played the previous installments and that would throw me off so it’s nothing against those two games. But it’s the lack of backwards capability that’s completely throwing me off here. Just like Megan Fox, all the PS4 has going for it are its looks while packing little to no redeeming qualities to make want to own one. Wii U: The least liked the least popular, and the least appealing of the three. But, it’s also the one of the three I will be purchasing first. Say what you will about the Wii U and how gimmicky it is, at least it caters to the financially conscious and financially strapped gamer. It’s the most affordable with a reasonable price tag with the most expensive one being slightly under $350. But not only that, it actually has a long list of games I actually want to play as opposed to its oppositions: The Wonderful 101, Pikmin 3, Super Smash Bros 4, Monolith Software’s sequel to Xenoblade Chronicles entitled “X”, Bayonetta 2! I haven’t forgotten its wide array of indie games that are being developed for it such as C-Wars, A Hat in Time., and most recently, Mighty No. 9, I don’t have to buy another TV to play it because it will work on my current television, It doesn’t need the Internet to be fully operational, it’s 100% backwards compatible with its predecessor’s library insuring my copy of No More Heroes will be played on, no matter what happens to my Wii. Best of all, I won’t have to sell my bodily fluid just to keep it running and all you’ll really need is electricity to run it. Even though I’m singing the Wii U’s praises of not being an impractical gaming brick like the Xbox one, am I going to buy one right now? Hell No! Just like the other two the consoles it’s heavily reliant on patience and future potential with the promise of actual game…a little later. So in summarization, The Xbox one is insanity incarnate, The PS4 is pretty good and shows but not creative promise at least just not right now and that’s all it has. Wii U will be in the homes of millions more buyers in mid-2014 because it isn’t going anywhere as it stands now. All in all this is the most underwhelming and depressing time to be a gamer in which I fear if this is the potential our media has been reached then, I would most likely sit this entire generation of console out but I still have my 3DS. Though, I do hear wonderful things about PC. That video is awesome! So true too! I don’t know what to say about this generation. People are very disappointed even now two years on from the release of their consoles. The prices are too high, the games (even now) aren’t interesting a lot of people and it seems to be all about graphics with the consoles and the games which is sad. I want more attention to backwards compatibility and games with more story, not graphics and remastering.